Girl Scouts have fun at the Broadway Block Party! Girl Scouts Emiko of Troop 2429, a Junior, and Sierra of Troop 628, a Brownie, enjoyed the lively atmosphere, free popcorn, crafts and prizes. Girl Scout Emiko, a Junior from Troop 2429, showed her friend from the Mariposa Chorus the different Girl Scout uniforms on display. 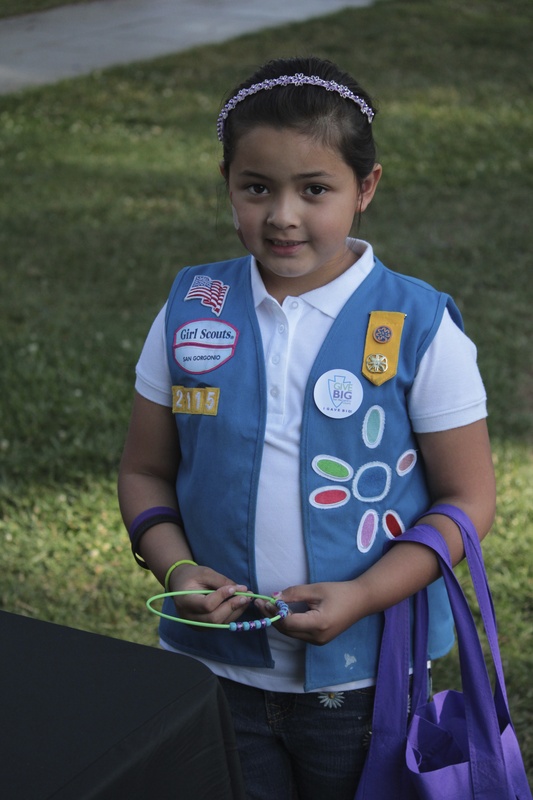 Girl Scout Angela, a Daisy from Troop 2115, used beads in a crafting project while Girl Scout Sierra, a Brownie from Troop 628, played the bean bag “frog” toss at the GSSGC booth with her younger siblings. A Girl Scout/Boy Scout bonding moment: swapping cookies for popcorn! 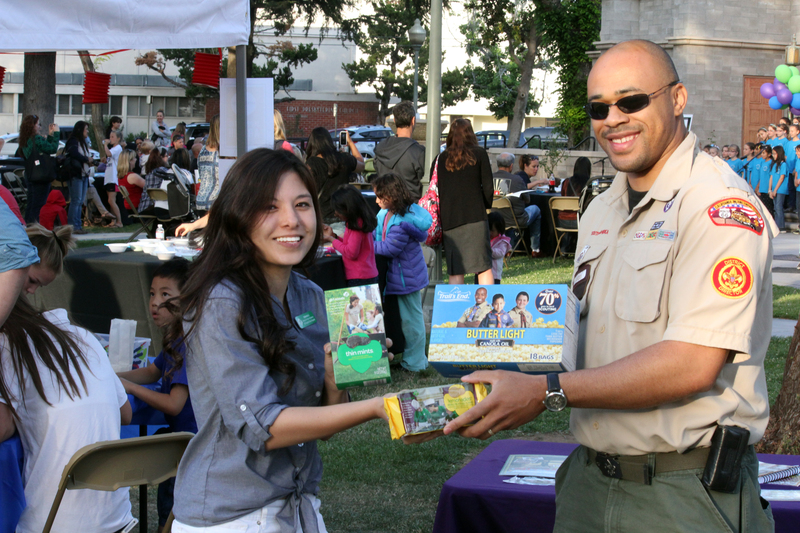 There was even a friendly swap of Girl Scout cookies for Boy Scout popcorn between GSSGC’s Katherine Smith and BSA-CIEC’s (Boy Scouts of America – California Inland Empire Council) Ricci Dula. Organizations participating at the Broadway Block Party were: the Boys and Girls Club of Greater Redlands-Riverside; Crafton Hills College Foundation; Family Service Association of Redlands; GSSGC; Historical Glass Museum Foundation, Redlands Art Association; San Bernardino County Museum Association; Wildlands Conservancy; KVCR; Arts Connection; Yucaipa Animal Placement Society; KVCR; BSA-CIEC; and Redlands Community Center. Girl Scout Angela with her family. GSSGC’s Chuck Mackinnon giving BIG live at the event! Even this puppy made an appearance. The Mariposa Elementary School Chorus performing at the block party. Previous Previous post: THINGS TO DO: Dial “M” for Mother’s Day murder, mystery and more! Next Next post: Detectives at heart, have you met our Council’s keepers of history yet?